Russia`s EU ambassador has suggested a UK research laboratory could be the source of the nerve agent used in the attack on an ex-spy and his daughter. Vladimir Chizhov told the BBC`s Andrew Marr Show that Russia had "nothing to do" with the poisoning in Salisbury of Sergei Skripal and his daughter Yulia. He said Russia did not stockpile the poison and that the Porton Down lab was only eight miles (12km) from the city. The government dismissed his comments as "nonsense.
" Retired military intelligence officer Mr Skripal, 66, and Yulia, 33, remain critically ill in hospital after being found slumped on a bench in Salisbury city centre on 4 March. UK Prime Minister Theresa May told MPs that personnel from the Defence Chemical Biological Radiological and Nuclear Centre at Porton Down in Wiltshire had identified the substance used on them as being part of a group of military-grade nerve agents developed by Russia known as Novichok. 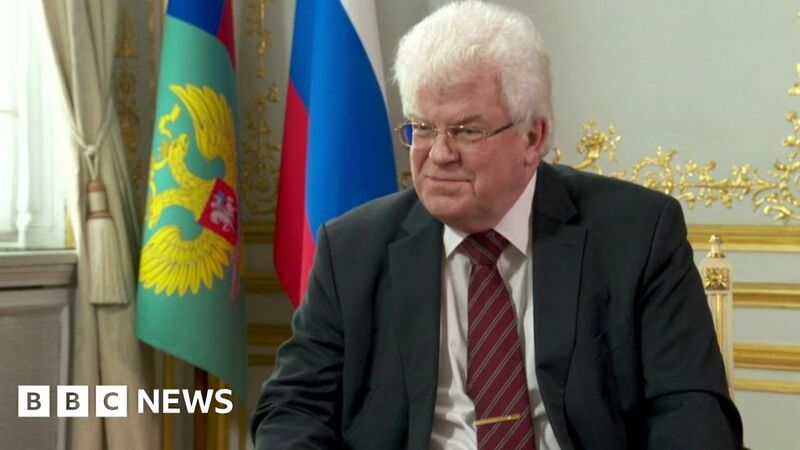 Mr Chizhov`s comments come after a Russian foreign ministry spokeswoman said the UK was one of the most likely sources of the nerve agent, along with the Czech Republic, Slovakia, Sweden or possibly the United States. Maria Zakharova said a large number of ex-Soviet scientists had gone to live in the West "taking with them the technologies that they were working on". Czech foreign minister Martin Stropnicky said the claims were "unsubstantiated" and "a classic way of manipulating information in the public space", while Sweden also "forcefully" rejected the suggestion. Mr Chizhov told the BBC that Mr Skripal could "rightly be referred to as a traitor" but "from the legal point of view the Russian state had nothing against him". Asked how the nerve agent came to be used in Salisbury, he said: "When you have a nerve agent or whatever, you check it against certain samples that you retain in your laboratories. "And Porton Down, as we now all know, is the largest military facility in the United Kingdom that has been dealing with chemical weapons research. And it`s actually only eight miles from Salisbury.
" But pressed on whether he was suggesting Porton Down was "responsible" for the nerve agent in the attack, Mr Chizhov said: "I don`t have evidence of anything being used.
" He added: "I exclude the possibility of any stockpiles of any chemical weapons fleeing Russia after the collapse of the Soviet Union, but there were certain specialists, including some scientists who today claim to be responsible for creating some nerve agents, that have been whisked out of Russia and are currently residing in the United Kingdom.
" The Foreign Office said there was "not an ounce of truth" in his suggestion of a link to Porton Down. A spokesperson said: "It`s just another futile attempt from the Russian state to divert the story away from the facts - that Russia has acted in flagrant breach of its international obligations.
" The Russian government has denied any involvement in the attack. On Saturday, the Russian foreign ministry said UK staff would be expelled from Moscow within a week in response to Britain`s decision to expel 23 Russian diplomats. Writing in the Sun on Sunday, Foreign Secretary Boris Johnson described the closures as "futile" and said they would "only punish ordinary Russians" by depriving them of opportunities to learn English and apply for visas to visit Britain. He added: "We have consistently taken a strong and principled stand against the Kremlin, and galvanised the international response. "So I believe that what happened in Salisbury was, at least in part, the Kremlin`s way of hitting back at Britain for standing firm against its appalling behaviour.
" Earlier, Theresa May said the UK government would consider its next steps "in the coming days, alongside our allies and partners". She said: "Russia`s response doesn`t change the facts of the matter - the attempted assassination of two people on British soil for which there is no alternative conclusion other than that the Russian state was culpable.
" Addressing the Commons last week, Mrs May said the decision to point the finger at Moscow was also based on "Russia`s record of conducting state-sponsored assassinations and our assessment that Russia views some defectors as legitimate targets for assassinations". Also on Saturday, counter-terrorism police renewed their appeal for sightings of Mr Skripal`s burgundy BMW 320D saloon car, registration HD09 WAO, in Salisbury on the morning of Sunday, March 4.